It seems everything is moving online these days. Even our education is transferring onto the internet. Many people might squabble about the disadvantages of this phenomena, but today, I want to discuss the advantages of getting an education online. This is a pertinent topic, as the future of education is moving more and more towards shifting physical educational institutions online. There are reasons for this: many times you can learn whatever you want, it is more comfortable in a variety of ways, online courses often look good on resumes, the pacing of learning is managed by the learner, and the cost of virtual education is often lower than traditional education. The freedom to choose your educational path is an enduring quality of online education. For more creative people, or people who want to focus on a single activity, this can be a dream come true. According to elearning Industry, “You can pick the program of your dreams in traditional education, too, but that would involve traveling away from home, living in a completely unknown city, and struggling in an extremely competitive learning environment. With online education, you can take any program or course present in traditional four-year universities” (Norman, Stephanie). So, the ease of access to the courses and majors you are striving to study are widely available online. This increases opportunities to gain the education we desire instead of making needless compromises. Like the last point, comfort takes center stage for many students. Countless students choose online education in order to avoid wasting time travelling and on many other activities in order to attend physical education institutions. According to the Open Education Database, “Commercials that feature online students studying in their pajamas only skims the surface of one of the benefits of online education: no physical class sessions. Students listen to lectures and complete assignments sent to them electronically, with no need to fight traffic, leave work early for class, or miss important family time. Rather than miss important class sessions (due to weather conditions), students in online courses can always “attend” by participating in discussion boards or chat sessions, turning in their work on time, and watching lectures or reading materials” (“10 Advantages of Taking Online Classes”). In other words, by being an online student, you circumnavigate many of the issues that regular students endure on a daily basis. In addition, many employers are happy to see online courses on resumes. Many recruiters see the taking of online courses as a sign of taking initiative. As stated by Pongo Resume, “Employers respect a degree earned online as much as a degree earned from attending a brick-and-mortar school. They understand that with the technological advances we have today, more and more employees are getting their education and training online. Because hiring managers value continuing education and professional development, having the relevant courses and programs in the education section of your resume will demonstrate that you are resourceful and have taken the initiative to stay ahead of the curve and improve professionally” (“The Advantages of Online Learning for You and Your Career”). 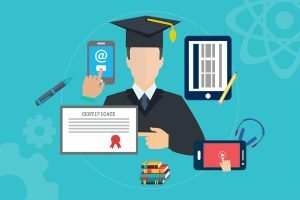 Therefore, not only is online education seen as equal to regular education by employers, but it is also viewed as being competent in the latest technologies and trends. Back to the students, one of the great advantages of online education is that learners can study at their own pace. According to eLearning Industry, “This type of system does not require attending live sessions; you can access the materials at any time that works for you. If you have to work or take care of your home and children during the day, you can study at night. That’s an advantage the traditional educational system cannot beat” (Norman, Stephanie). In addition, people who want to take a longer time to receive a degree can do so without any pressure. Finally, the cost of getting an online education is cheaper on average than receiving a traditional education. According to the Open Education Database, “Though not all online degrees offer less expensive net tuition prices than traditional colleges, associated expenses almost always cost less. For example, there are no commuting costs, and sometimes required course materials, such as textbooks, are available online at no cost. In addition, many colleges and universities accept credits earned via free massive open online courses (MOOCs), the most recent advance in online education” (“10 Advantages of Taking Online Classes”). Thus, there are a variety of reasons why an online education costs less. Receiving an online education is becoming more and more popular due to a multitude of advantages it has over traditional instruction. These advantages include, to name a few: students can learn whatever they want, it is more comfortable, online courses often look great on resumes, the pacing of learning is managed by the pupil, and the cost is often lower than traditional education. With these reasons, it is hard to not see why this form of education is on the rise. Norman, Stephanie. “5 Advantages Of Online Learning: Education Without Leaving Home.” eLearning Industry, 3 Aug. 2017, elearningindustry.com/5-advantages-of-online-learning-education-without-leaving-home. “10 Advantages of Taking Online Classes.” OEDB.org, Copyright © 2006-2019 OEDb – Accredited Online, Specialty, and Campus-Based Colleges, 10 Aug. 2018, oedb.org/ilibrarian/10-advantages-to-taking-online-classes/. “The Advantages of Online Learning for You and Your Career.” Pongo, www.pongoresume.com/articles/513/the-advantages-of-online-learning-for-you-and-your-career.cfm.